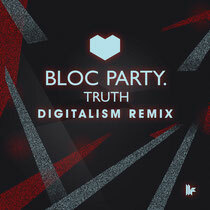 Celebrating ten years of Toolroom Records, the label releases two remixes from Digitalism, taking their trademark sound to two successful bands, Bloc Party and The Rapture. Poised to assault the US on their upcoming tour, Digitalism continue to make great music. The recent rerelease of ‘Zdarlight’ on Toolroom received huge support worldwide, twice charting in the Beatport top 10 and crossing genres with its eclectic remixes. Bloc Party are one of the UK’s cherished bands, with countless international tours and four artist albums. Taken from their current album ‘Four’, Bloc Party‘s single ‘Truth’ has already captured the hearts of the indie rock audience with its simple message and melody. Now, Digitalism re-establish the track with great results. Keeping Kele Okereke’s vocals at the fore, Digitalism layer on the synths and electronic textures to create a lovely balanced indie dance tune looks set to ignite the upcoming festival season. It’s out May 13. Following this release, Toolrrom release the second installment from Digitalism with their remix of The Rapture’s ‘Sail Away’, out June 3.